Been a bit swamped with work round here lately. We took on a new client in the form of an agency last week and seems like they’re going to have plenty to keep us occupied! Plus a couple of ongoing sites too so it’s all go here. In between work I’m still trying to put the finishing touches to a new plugins site that I’m setting up with a friend, one I’m eager to get up and running and get more plugins written for. However, I’ve managed to finally get all of my photos from Rome on Flickr at last. I’m quite chuffed with some of them, the beautiful blue sky and weather out there helped! Cheers Si. I just find WordPress so flexible, and you’re right, the volume of themes and plugins available is massive, as is the amount of information about it. Makes life so much easier to find a way to do something! Wow, Rome is really beautiful! Sorry, where are you from? aaaaaa…Rome so close to you! Where in rome are they taken ? Those are absolutely awesome photos, benefited both by the great weather and a very talented eye for photography. I thought we had great weather and blue skies when we visited room in September 2004, but those blue skies in your photos are terrific! Lana, thanks. My photos were taken all around the centre of Rome. 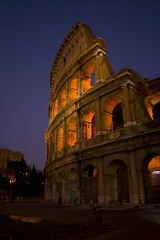 The photo above is of the Colosseum. David – thanks. The great weather really helped! Not sure about the talent though! I’d only had the DSLR for just over a month at that point so a lot of photos were taken and just a few selected. The photos all benefit from a circular polariser as well which made a major difference too. Ha, it seems I was in Rome about a month before you were. Very nice to see the same shots from near the same time. Nice shots, thanks for the post.